Calamity control – Hoondert Groep B.V.
We have entered into contracts with public bodies to deploy people and equipment in case of calamities on land or on water. We are at your service, 24 hours per day, 7 days a week, the whole year round. Our equipment can be used anywhere and our people will act effectively and responsibly in any situation. 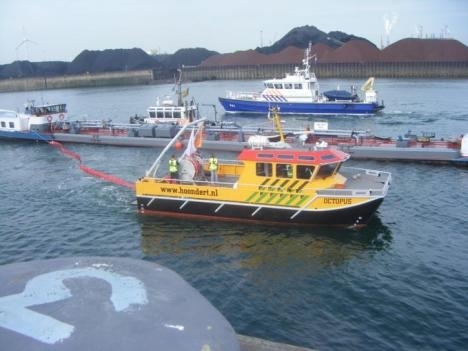 Hoondert has ultra-modern equipment to deal with calamities on water. Whether it’s an oil spill or the salvaging of lost cargo, our range of equipment is wide enough to be able to tackle any job. Our employees, among whom professional divers, have ample experience in dealing with calamities. By means of our catamaran Octopus, we will reach any location very quickly and thanks to our contacts with affiliated companies, we can quickly get hold of any equipment not at our disposal at the time. Where calamities on land are concerned, Hoondert has all the necessary equipment and knowledge to efficiently tackle any calamities that may occur. Cordoning, road cleaning, oil-track removal, recovery operations, decontamination jobs – we’ll tackle them all.